Welcome to the 67th edition of Passing of the Pioneers. This month eight new pioneers from districts including Camperdown, Macarthur and Balmoral join the Pioneer Obituary Index . MANIFOLD, John – Died 3 January 1877 at Purrumbete. John Manifold was born in Cheshire, England in 1811, the fifth son of William Manifold and Mary Barnes. In 1831, the Manifolds left England for Tasmania to meet up with John’s brother Thomas who had gone ahead three years before. They settled there but in 1836, Thomas Manifold was keen to see the colony of Victoria of which he was hearing stories. He travelled to Point Henry near Geelong and took up land on the Moorabool River. He put his two younger brothers, John and Peter in charge of the property and he returned to Tasmania. 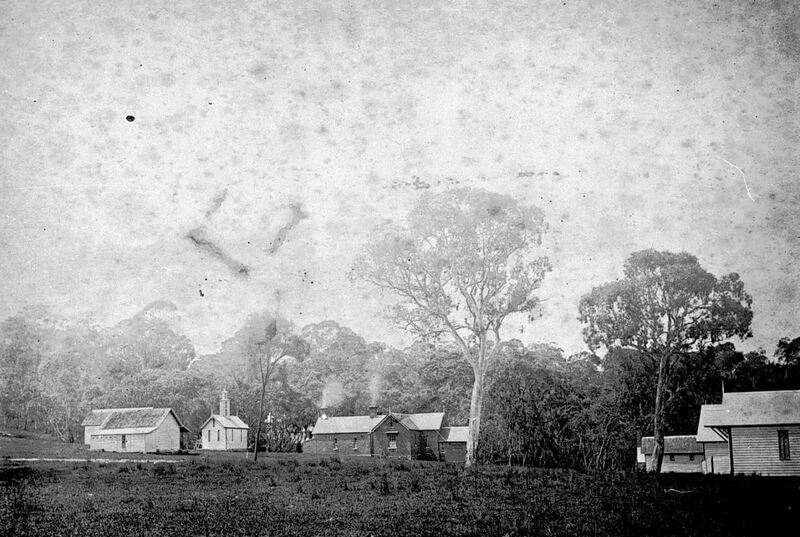 John and Peter wanted to investigate the land further west and in 1838 found themselves on the shores of Lake Purrumbete and decided that was the place for them. Thomas joined them but later went to the Grassmere run further west. John and Peter built up their property Purrumbete and eventually switched from sheep breeding to cattle. On 4 September 1856, John married Marion Thomson at West Tamar, Tasmania. They went on to have four sons and five daughters including past Passing Pioneers, Edward, James Chester and William. John wasn’t interested in public life but he and Peter were generous contributors to the community. 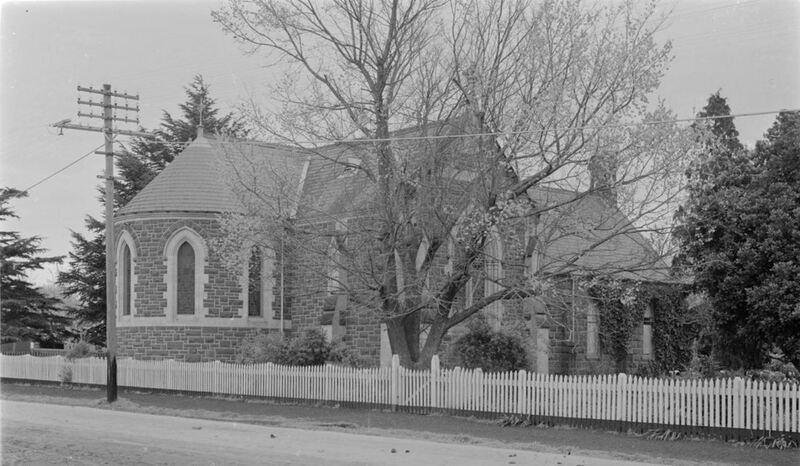 One example of their generosity is St Peters Church, Camperdown (below) to which they contributed greatly. ARMSTRONG, Alexander – Died 12 January 1890 at Shelford. Alexander Armstrong was born at Kildonan, Scotland around 1824. He married Barbara Thomson in 1851 and soon after they set sail for Australia on board Europa with Alexander’s sister Christian and her new husband James Thomson, arriving in 1852. The following year Barbara died. Alexander first managed Warrambine (also known as Warrambeen) for Major John Bell until Bell’s death in 1876. He was left £2000 from Bell’s estate. He then took up a lease on the property and remained there until his death. In 1859, Alexander married widow Betsy Thomson (nee Sutherland) and they went on to have a large family. 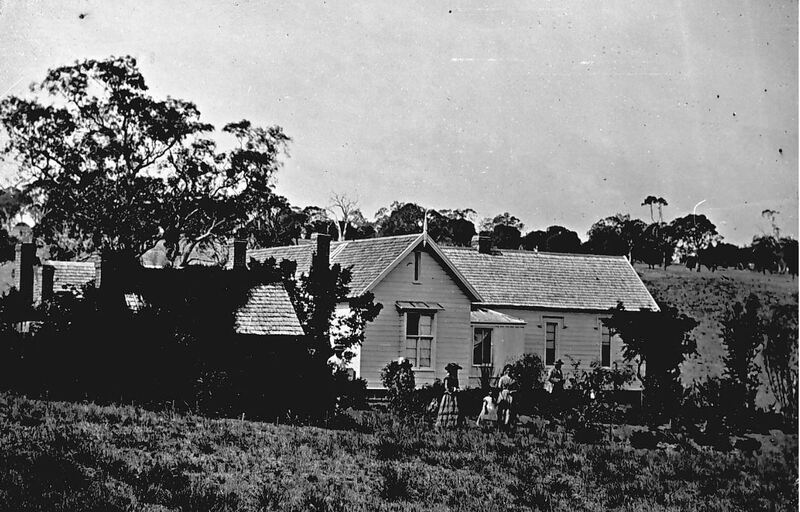 Alexander’s sister Christian Thomson and her husband James took up residence at Monivae south of Hamilton in 1870. In 1888, Alexander purchased properties close by, Upper Audley and Arrandoovong near Branxholme. 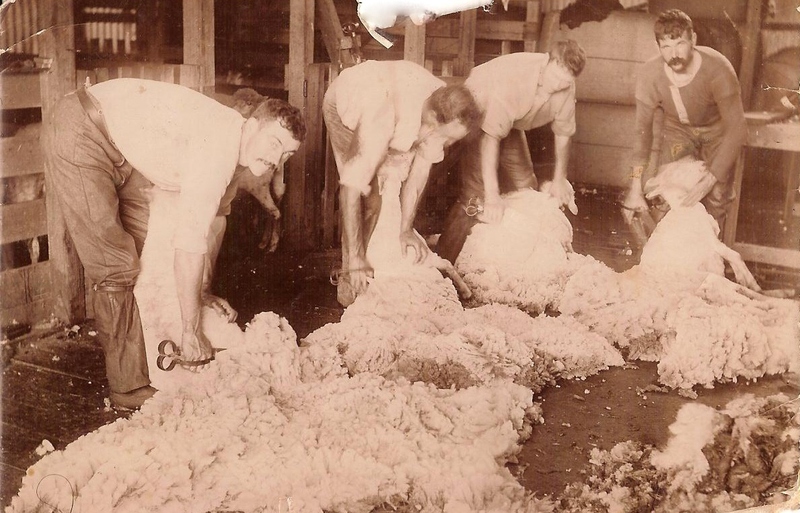 He also had interests in an estate in the Riverina district of NSW. At the time of his death, Alexander was the oldest councillor on the Leigh Shire Council, representing the East Riding. He was known as generous and charitable and a leading member of the Leigh Presbyterian Church at Shelford. At the time of his death, Alexander left his widow Betsy, five sons and four daughters. He was buried at the Golf Hill Cemetery, Shelford. Alexander’s estate was worth more than £200,000. The estate of Alexander Armstrong retained Upper Audley until 1906 and Arrandoovong remained within the Armstrong family until 1923. 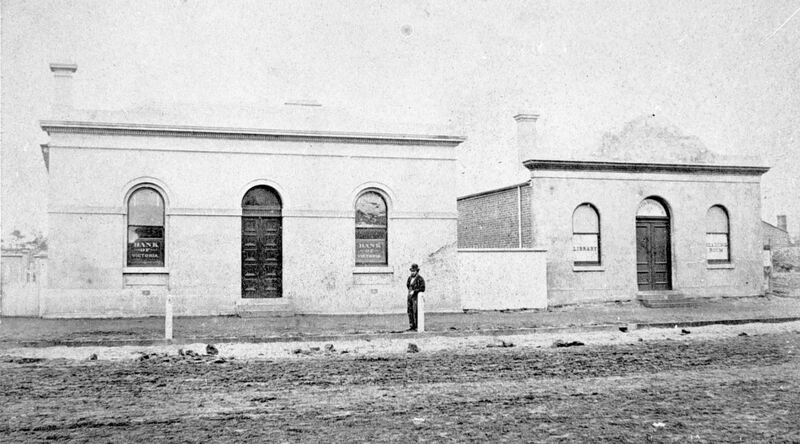 Betsy stayed on at Warrambine until the lease expired on 20 December 1892. She moved to Brighton and died in 1923. ROBERTSON, George – Died 15 January 1890 at Warrock. The Hamilton Spectator/Casterton News stated George arrived in Van Diemen’s Land (Tasmania) in 1843 aboard Lord Goodridge, staying there three or four years before travelling to Victoria with his brother J. Robertson “who took up Wando Vale estate”. Meanwhile, the Portland Guardian stated George had sailed on Lord Gaderage arriving in Van Diemen’s Land in January 1840 where he stayed a month before sailing to Victoria on Eagle captained by Captain Fawthrop of Portland. A fellow passenger was William Corney and they landed at Portland Bay on 7 March 1840. It continues…”He then joined his cousin J.G. Robertson who took up Wando Vale estate. He remained with his brother for three years…”. 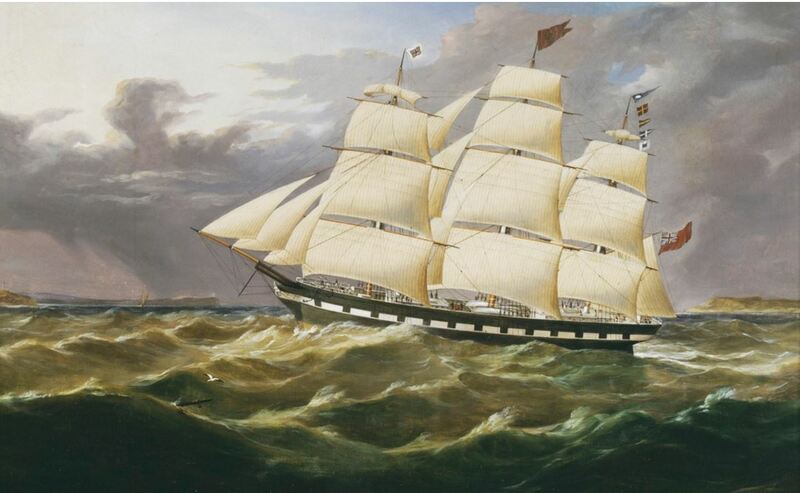 Checking the shipping news in newspapers of the time, I found George’s ship from England was not Lord Goodridge or Lord Gaderage, but rather Lord Goderich, also used to transport convicts. 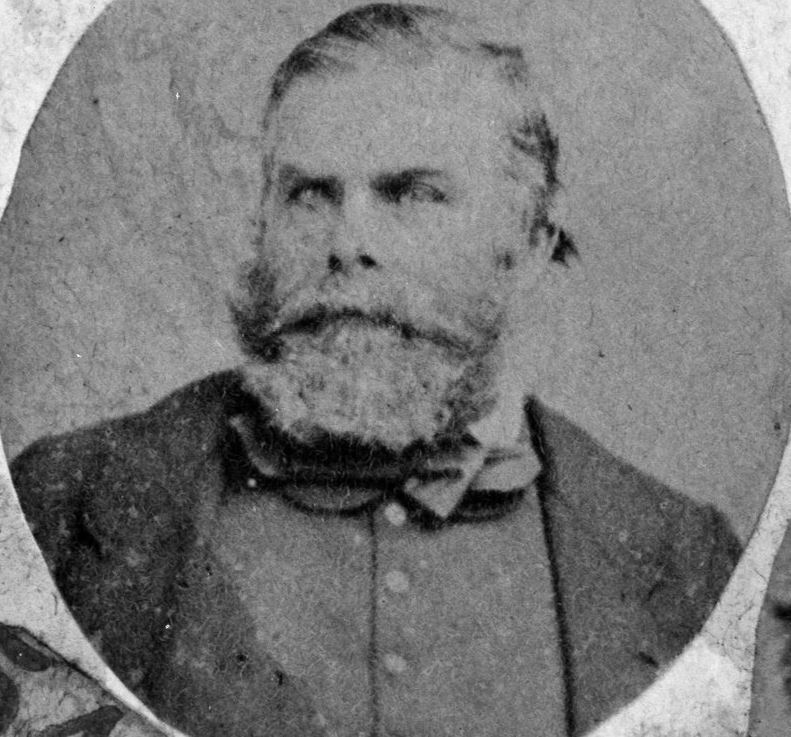 The Lord Goderich arrived at Launceston on 7 February 1840. George would have been around thirty-two at the time. On board was a Mr Robertson and two Misses Robertson. Unfortunately, there were no initials to help confirm if it was George. While George might not have been related to the two Misses Robertson, he did have at least two sisters who came to Australia, Isabella and Ann. However, Isabella didn’t arrive in Australia until 1849 when she arrived with her husband Hugh Patterson and their family aboard Duchess of Northumberland. George’s cousin John George Robertson (Wando Vale estate) who had already arrived in Van Diemen’s Land by 1840 also had at least two sisters who came to Australia. Maybe they were the two Misses Robertson. 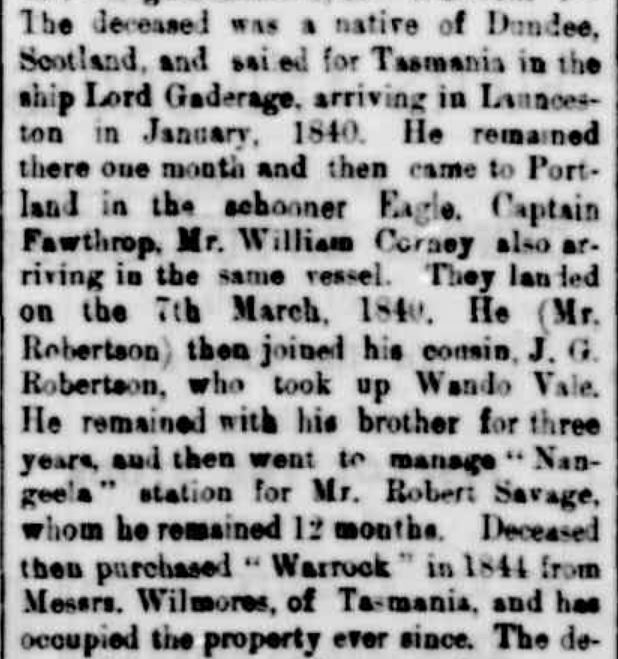 The Portland Guardian obituary stated George only stayed in Tasmania about a month before going to Victoria on Eagle. Sure enough, Eagle did sail to Victoria in the suggested timeframe, leaving Launceston on 28 February 1840. On board were sheep, bullocks and horses for cousin John Robertson. Also, the Guardian mentioned William Corney was a passenger on Eagle with George. 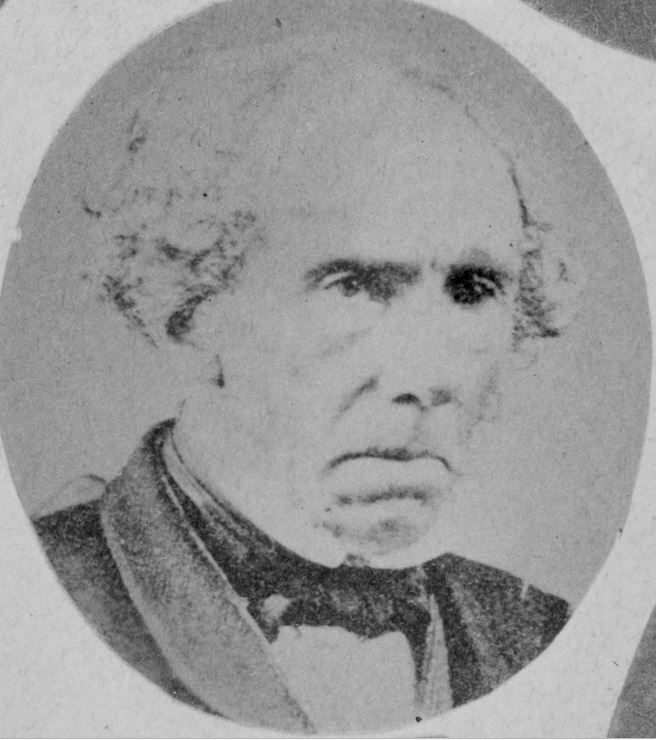 William Corney later married George’s cousin and sister of John Robertson, Stephen Rowan Robertson. 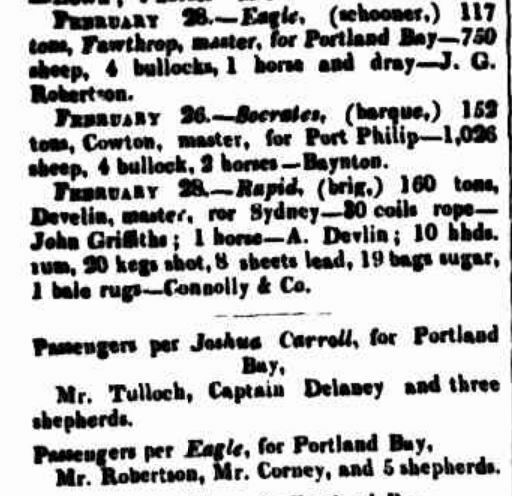 The shipping report from Launceston’s The Cornwall Chronicle in February 1840 shows there was a Mr Robertson on board Eagle and he was travelling with Mr Corney. But was it John Robertson not George Robertson on Eagle? There’s a good chance it was John. Not only was there stock belonging to John on the ship but it’s likely at least two if not all the shepherds on Eagle were off to Portland Bay to work for John. Only a month before the Eagle departed John Robertson, then living at Lake River in Van Diemen’s Land, advertised for shepherds and a splitter to go to Portland Bay. In addition, 1840 is the year generally given as the year John Robertson took up the Wando Vale run. Checking shipping arrivals and departures via the Names Index on the Libraries Tasmania site, I found John Robertson made more trips from Tasmania to Portland Bay on Eagle in February and March but unfortunately no mention of George. The newspapers show several voyages to Portland in the first months of 1840 with John’s stock on board. 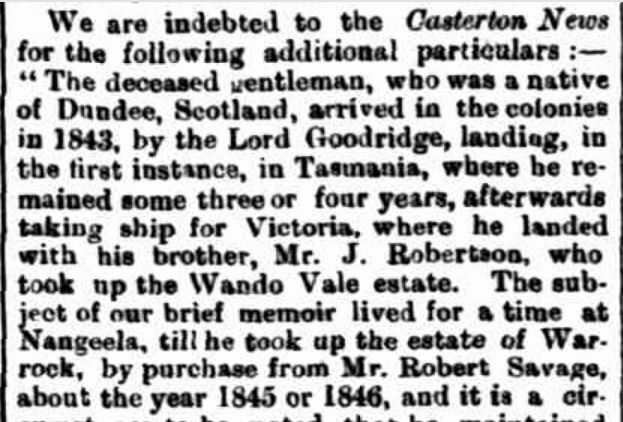 In contrast to the Portland Guardian, the Casterton News/Hamilton Spectator obituary stated George travelled to Victoria in 1843 with his brother J.Robertson. The Portland Guardian had a bet each way as to whether George had a brother J.Robertson stating after George arrived in 1840, he went to stay with his cousin J.G.Robertson, staying three years with his brother. The Casterton News/Hamilton Spectator continued, suggesting after his 1843 arrival he then went to Nangeela, west of Wando Vale estate. Although not mentioned in the obituary, Nangeela was held by Robert Savage in 1843 with Captain Robert Dana. But the Casterton News/Spectator went on to say George purchased Warrock from Robert Savage in 1845 or 1846. However, William Wilmore owned Warrock at the time of George’s purchase, supported by the Portland Guardian obituary which said George purchased Warrock in 1844, the generally accepted year. After all that we are really none the wiser as to when George arrived in Victoria, although the Portland Guardian was probably closer to the mark. Either way, George was at Warrock on the Glenelg River from around the mid-1840s. Moving on to the 1850s, The Argus reported in February 1851, George had lost his home and between 1000 and 2000 sheep in a fire. The following year, he married his cousin Mary Ann Robertson, a sister of John Robertson of Wando Vale. They never had children but instead devoted their lives to Warrock and charitable work. Over time, George built a large pastoral complex at Warrock. 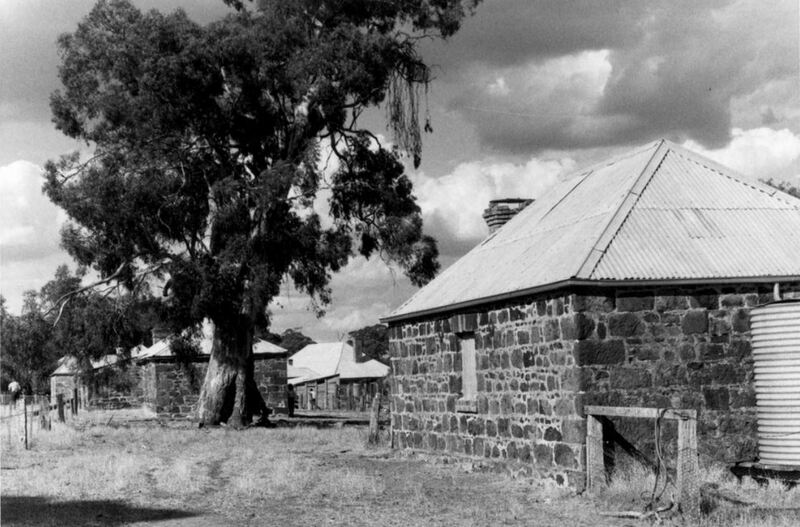 Not just the usual homestead, woolshed and staff quarters but more than fifty mostly timber buildings including a church. Mary Ann established a beautiful home, known for its tasteful decor. George led a quiet life only stepping into public life to sit on the Glenelg Shire Council. As mentioned he was charitable and supported among other things, the Hamilton hospital, local public schools as well as the Casterton and Sandford Mechanics Institutes. 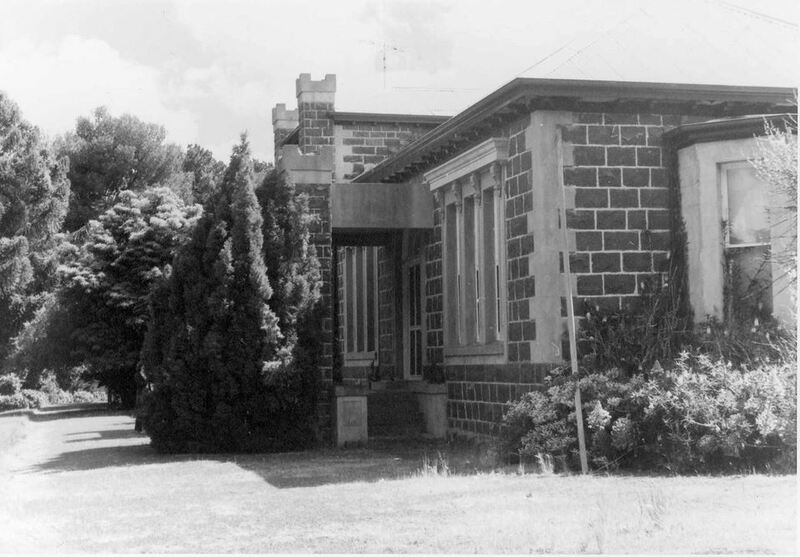 He was the founder of the Casterton Mechanics Institute (below) and was president at the time of his death. He also donated to churches of all denominations. Another passion for George was his dogs, importing Scotch Collies from the home of his birth. The Kelpie breed descends from a pair of George’s imported collies. Mary Ann died in 1886 and George died four years later leaving his large estate to his nephew George Robertson Patterson, a son of his sister Isabella. George was buried at the Old Casterton Cemetery. You can see more of Warrock on the property’s website on the link www.warrockhomestead.com.au or Facebook page. www.facebook.com/warrockhomestead Restoration is in progress with wonderful results so far. George and Mary Ann would be pleased. FAHEY, Patrick – Died January 1911 at Macarthur. Patrick Fahey was born in Ireland around 1883. He arrived at Port Fairy about 1854 and settled at nearby Coddrington. When land became available further north in the 1860s he selected land near Macarthur. He stayed on his land until the mid-1870s when he built the Farmers Inn within the Macarthur township. Patrick married Catherine O’Connor. Catherine died in 1881 aged forty-four. 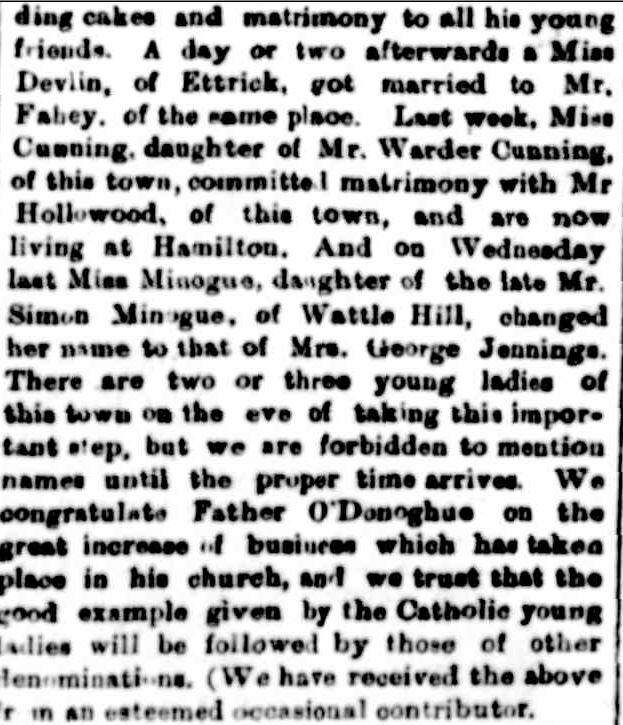 He remarried to Mary O’Donnell in 1890. Patrick operated the Farmers Inn for around nineteen years, making additions in 1883. He sold to Miss Grogan in 1892. Patrick then retired and lived out his days at Macarthur. At some stage, an accident resulted in the amputation of one of his legs. Patrick was known for his good humour and his charitable ways. He left his widow, Mary and six sons. The Farmers Inn burnt down on 18 June 1906. MOLLOY, James – Died January 1913 at Balmoral. James Molloy was born in Dublin, Ireland around 1853. He arrived at Portland around the age of sixteen. He went straight to Charles Armytage‘s Fulham estate near Balmoral where he had a job. After much hard work, James rose through the ranks until he became the manager of the property. He worked there for forty-four years until his death. A Hamilton Spectator article from 2 September 1897 describing the Fulham stud stated James was “as enthusiastic a sheep man as one would care to meet”. James was a member of the Balmoral Pastoral and Agriculture Society. He never married and left two sisters still living in Ireland at the time of his death. James was buried at the Harrow Cemetery. SAVIN, William – Died 2 January 1924 at Portland. William Savin was born at Launton, Oxfordshire around 1843. In late 1852, William left England with his parents Samuel Savin and Hannah Wise and five siblings aboard Eliza and landed at Portland in 1853. The family headed to the Upper Crawford estate near Branxholme where there was work available. Samuel then purchased the first land available for sale at Muddy Creek, just south of Hamilton. 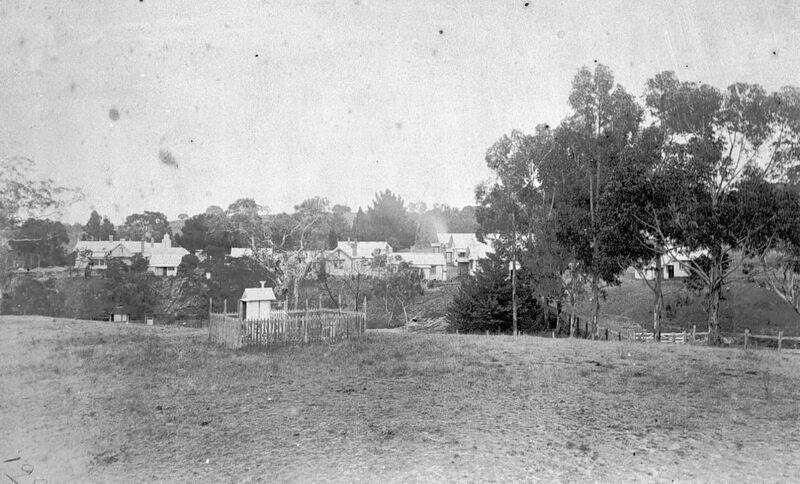 When William was older, he and his brothers selected land at Mount Eccles (Budj Bim) near Macarthur. In 1865, William married Elizabeth Addinsall and they went on to have three daughters. Around 1900, William and Elizabeth retired to Portland where William was a member of the bowls and golf clubs. He also had an interest in political happenings and was a past member of the Hamilton Farmers Union in the 1880s. Elizabeth died in 1912 at Portland. William remarried to Theresa Lear in 1913. They were living in Cameron Street, Portland when William died. He left his widow Theresa and three daughters from his first marriage. HOOD, Eliza Mary – Died 22 January 1926 at Malvern. Eliza Hood was born in Belfast, Ireland around 1847. With her parents, she arrived at Hobson’s Bay, Victoria in 1852 aboard Marco Polo. 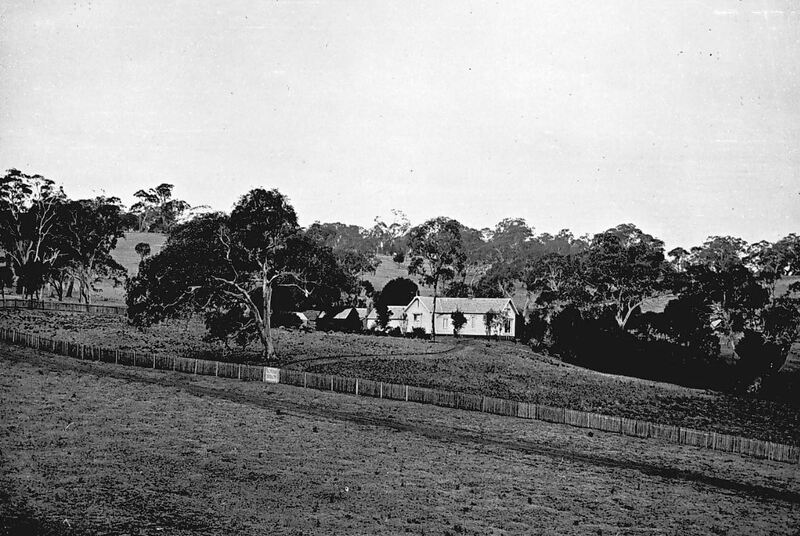 Eliza’s father John Hood was a doctor and he set up a practice in Camperdown. 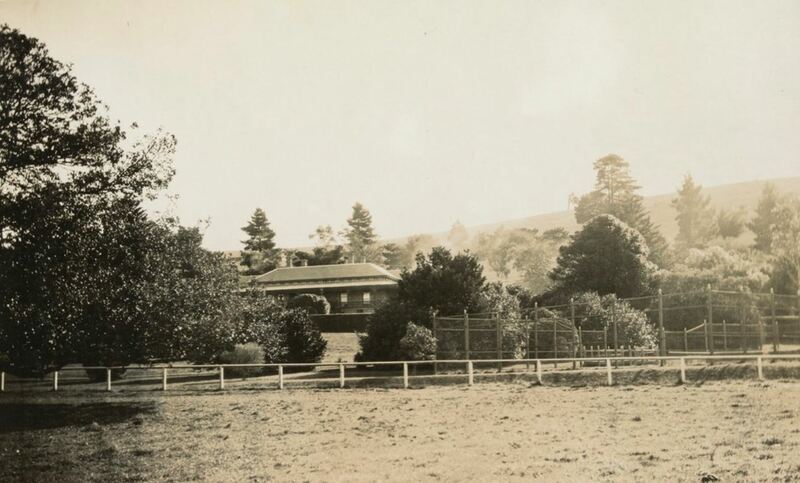 When Eliza was older she opened the Camperdown Ladies’ College. 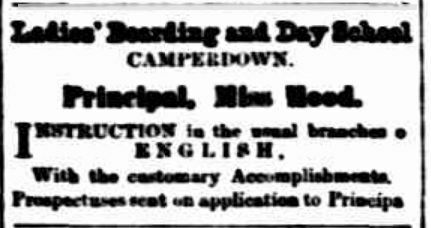 In 1878, she was given a farewell as she was off to New Zealand to take up employment at the Invercargill Ladies High School. 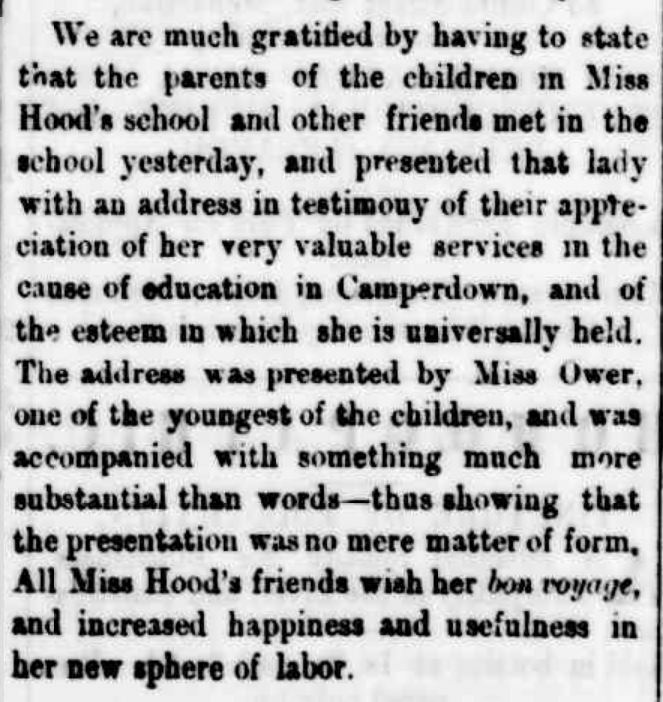 Eliza returned to Camperdown around 1881 and continued to educate the young ladies of Camperdown and district. 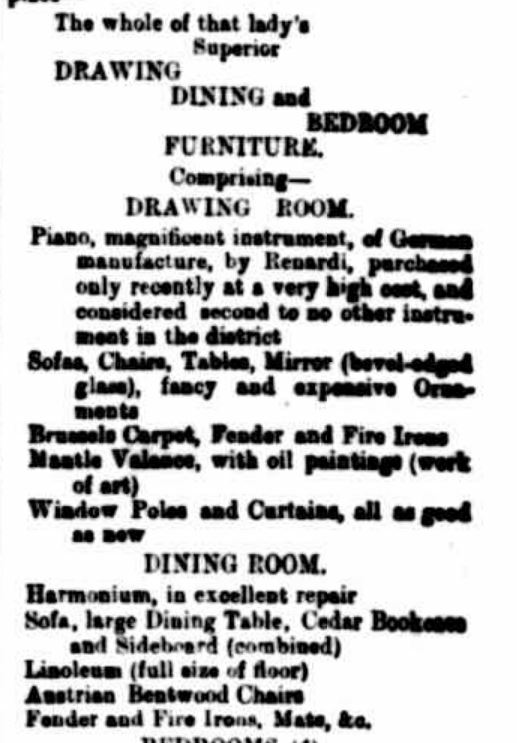 In May 1886, the Camperdown Chronicle announced Eliza was leaving the district and selling her home in Brooke Street along with her furniture including a German-made piano, a harmonium and even the curtain rods. 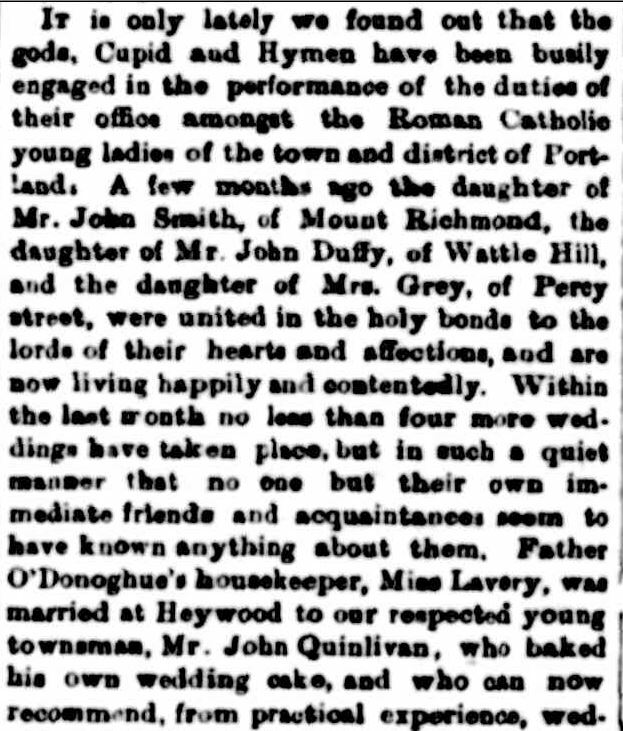 In early August 1886, news came to Camperdown of Eliza’s marriage. 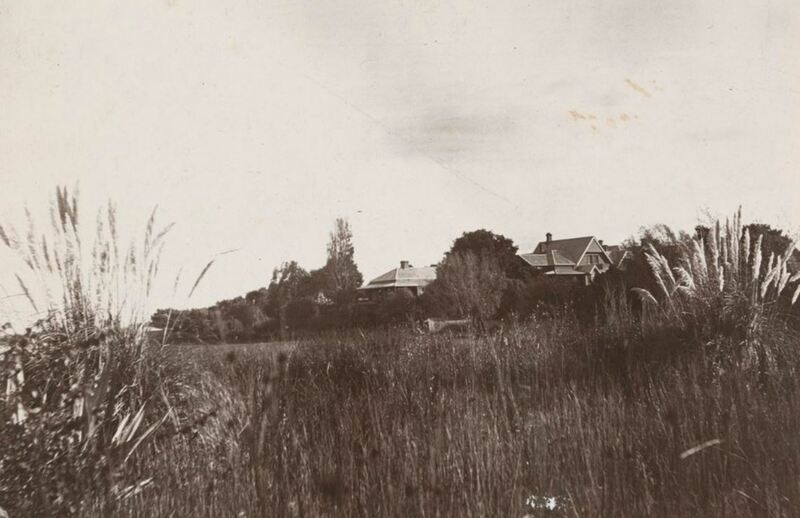 At the age of thirty-nine, Eliza married in Melbourne to widower sixty-eight-year-old Peter McArthur of Meningoort near Bookaar just north of Camperdown, on 31 July 1886. Peter’s first wife Margaret had died in 1883. Peter had nine children at the time ranging in age from their mid-twenties downwards. Eliza and Peter had one son George born in 1887. Peter died on 1 July 1897 aged seventy-nine. Eliza died at Malvern and her body returned to Camperdown for burial. CARMICHAEL, Thomas – Died 5 January 1930 at Casterton. Thomas Carmichael was born around 1874 at Casterton, one of fifteen children of Thomas Carmichael and Margaret Fletcher of Argyle station, Lake Mundi. 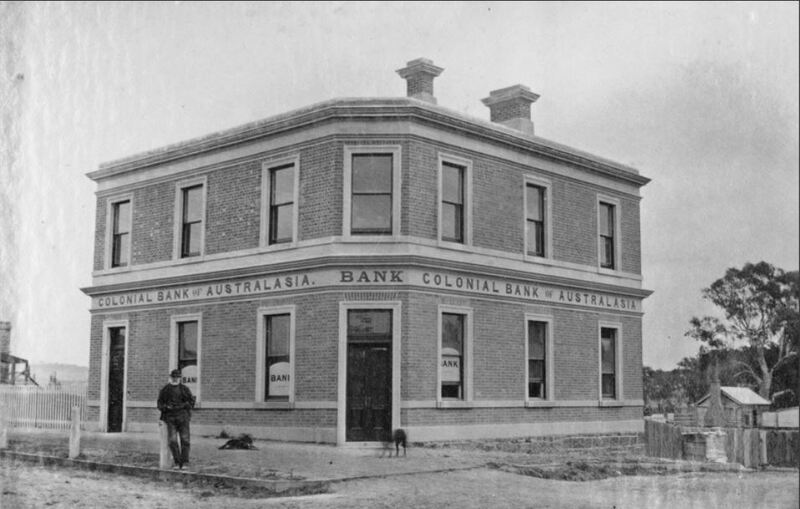 Thomas attended the Portland College and then went to work for the Colonial Bank at the Casterton branch (below). Banking wasn’t for Thomas and he resigned from the bank and returned to Argyle station. On 15 March 1915, Thomas married St Kilda’s Violet Malcolmson at Middle Park and they took up residence in Henty Street, Casterton. Despite living in town, Thomas kept a keen interest in the family-run Argyle and listed his occupation as a grazier. He was a leading bowler for the Casterton Cricket Club and a councillor with the Glenelg Shire Council for ten years from 1911. He was Shire President from 1919 to 1920. During his time on council, Thomas was the main protagonist for a proposed Casterton water supply scheme which was eventually introduced. He was also a supporter of the local returned servicemen after WW1. Thomas left his widow, Violet and four children.